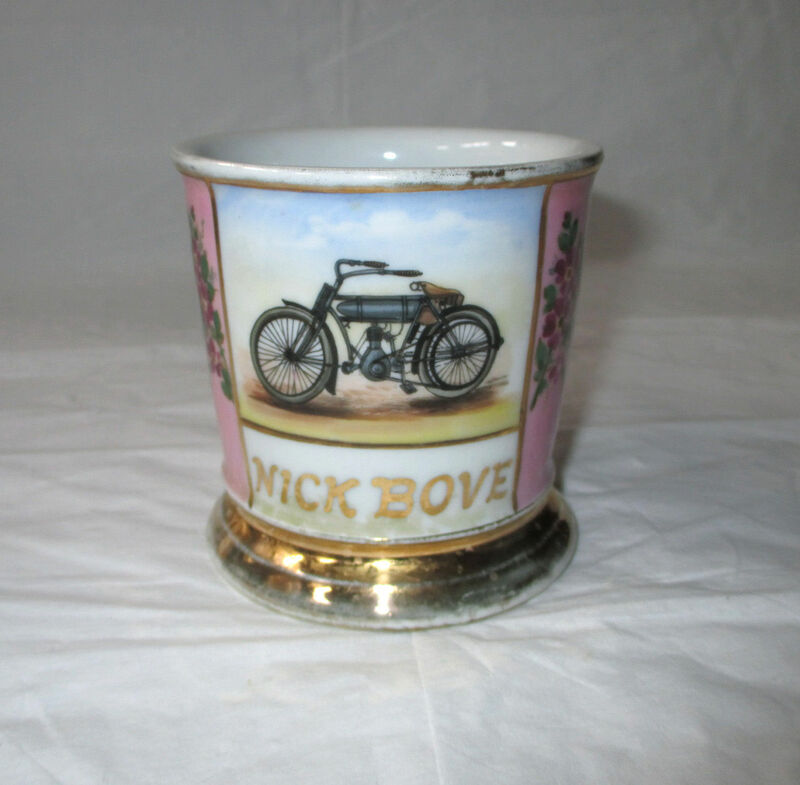 This listing is for a colorful handled shaving mug, personalized in gold with the name “Nick Bove,” and made by H. Wehinger & Co., Austria. The sides are a bright pink, decorated with intense purle flowers. The front (over the name) features a motorcycle! The rim, foot, and handle have somewhat worn gold trim. The mug measures 3-5/8 inches high and 3.5 inches wide across the rim. The mug is in good to very good condition. There are no cracks, chips, or crazing. There is significant wear to the gold trim on the rim, and less wear around the foot and handle. The motorcycle image and the pink sides very solid and colorful. H. Wehinger & Co. The company was founded by Heinrich Wehinger in Horn, Bohemia (now Hory, Czech Republic), in 1905, when he took over the operation of an existing pottery. The company made tableware as well as vases. It went bankrupt in 1928. There is some confusion about the closing date. Some sources say 1928, others 1945. This mark, called the “spittoon” mark, was used from 1905 to 1918. Here’s the good part: Sold on eBay for $1,600.